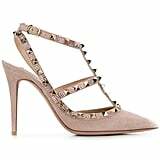 The Valentino Rockstud pump certainly had its moment after launching in 2010. 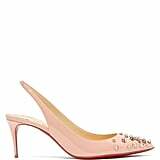 Just like so many popular designer silhouettes — the Chanel slingback, the Miu Miu ballet slippers — I'd be hard-pressed to retire such an iconic shape. Jennifer Lopez has worn Valentino accessories for many years (not to mention some pretty wild dresses from the fashion house), and it appears her Rockstud items are keepsakes. The newly engaged star stepped out for a late-night meeting in NYC wearing a classic Max Mara camel trench with her signature gold hoops and a Valentino Rockstud bag to coordinate with her heels. 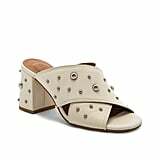 The strappy, embellished shoe that fashion fans would recognize anywhere is still available in multiple colorways, so clearly, the bandwagon is still accepting passengers. But if you'd rather a more modern take on the look, don't worry, we're here to help you out.